Time is an essential factor in modern lab analysis – the low-volume measuring cells in Anton Paar turbidity meters minimize the impact of carry-over effects within a series of samples and grant fast equilibrium. Samples are filled directly and are brought to the desired temperature – there is no need for preconditioning the sample to a desired temperature. Anton Paar’s measuring modules based on the Generation M platform are specifically developed for integration into new as well as existing analysis systems. The modular concept allows you to configure a measuring system that provides the exact parameters you intend to add for monitoring the quality of your product. Turbidity meters provided by Anton Paar are designed to fit a wide range of applications. Regardless of whether the task is to verify the filtering process of whisky or to monitor the product quality of infusion solutions in the pharmaceutical industry, an Anton Paar turbidity meter is always the right choice. 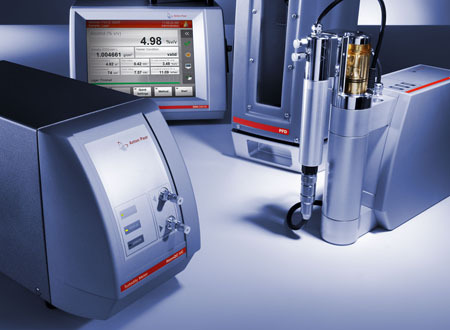 The proven ratio method employed for turbidity analysis by Anton Paar complies with various official standards such as the EBC or the MEBAK. Anton Paar turbidity meters are marked by their outstanding stability. Since checks using distilled water are absolutely sufficient to ensure the instruments’ proper performance over the entire measuring range, the required time to maintain the device is reduced to a minimum.